2009. Tor. Paperback. 192 pages. 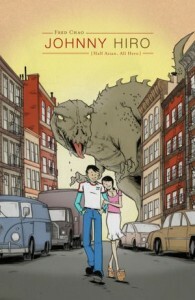 Fred Chao’s graphic novel, Johnny Hiro, is a wonderful blend of action-adventure, everyday trials, and the absurd. When Johnny and his girlfriend Mayumi’s apartment is destroyed by Gozadilla, they not only have to triumph over the giant lizard, but they also have to deal with their landlord who sues them for the damages. Further adventures find Johnny and Mayumi trying to please their bosses at work, enjoy a trip to the opera while dodging a group of samurai, and make some time to see each other. The humor comes through in both the drawing and the dialogue. I also enjoyed the bizarre cameos by celebrities such as David Byrne, Mayor Bloomberg and Gwen Stefani. 2011. Riverhead Books. Hardcover. 290 pages. 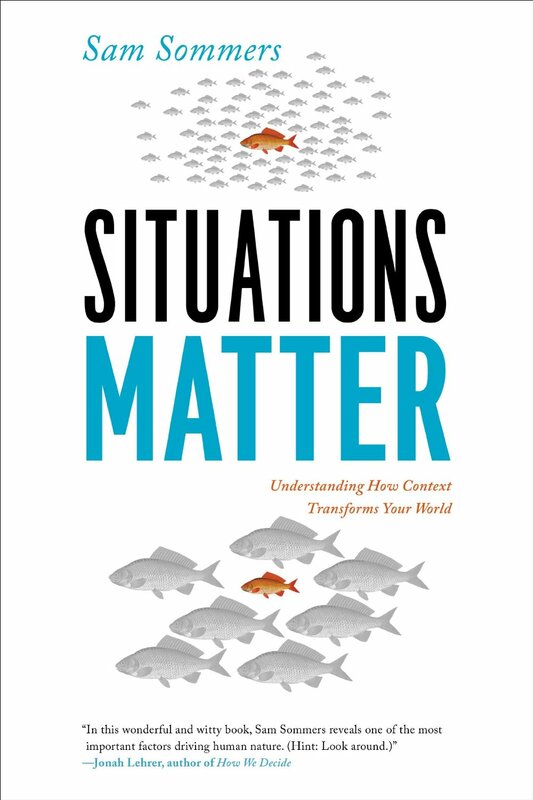 Situations Matter was a fast, enjoyable read. Sommers gives the reader an entertaining survey course on how little we understand the factors that cause people to do what they do – that cause us to do what we do. People often slip into the mindset of What You See is What You Get (WYSIWYG), but research study after research study shows that the reliability of this mindset is questionable. Chapters in the book address the bystander effect, groupthink, gender norms, factors in love and attraction, and bias against people outside the in-group. Some of the research studies were familiar to me, but there were some new ones that contained surprises. I liked how Sommers showed that our romantic relationships are influenced by more than just the other person’s personality and appearance. We give far less credit to factors such as proximity, familiarity, the perception of reciprocity, and perceived obstacles. Sommers is very personable, sharing often self-deprecating anecdotes from both his teaching life and his family life, that are still relevant to the points he is making. And even though a number of the points made in the book were not brand-new to me, I appreciated the refresher on why situations matter. It’s so easy to fall into making snap judgments about another person or about a situation, and this book reminded me that there is usually more to the story than first meets the eye. 2011. Hachette. Hardcover. 418 pages. In this fantasy novel, a girl named Karou lives a double life. Most of the time, she is a teenage art student in Prague, with a good friend and a bad ex-boyfriend. But she is also the foster daughter of and errand-girl for a powerful chimaera – some might say monster – who collects teeth for a purpose that is mysterious to Karou. One day while running an errand in Marrakesh, Karou crosses paths with an angel who tries to kill her. This encounter leads Karou to life-changing discoveries about her monster family and about her own past. 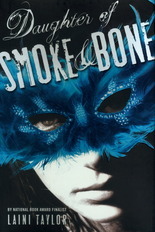 Daughter of Smoke and Bone almost lost me in its first fifty or so pages. The beginning seemed painfully overwritten to me and Karou’s run-in with her ex-boyfriend, her pranks during art class, and her Prague life did not engage me at all. But Brimstone and the other members of Karou’s monster family were fantastic creations, as was the world they came from. And once the characters from the other world take prominence, the novel just takes off in a good way. Taylor has pulled off some amazing world-building in this book. All of the scenes in the other world – the flashback history – were so vivid. There’s an atmospheric scene where a character walks among the dead in a battlefield that particularly sticks in my memory. The tragic moments in the story felt earned. The angsty romance actually had very good reasons for the angst. I was left stunned by the ending. Given these strong feeling, I of course sought out the next book, Days of Blood & Starlight, but for some reason couldn’t make headway with it, and decided to abandon it, for now. Presuming I have no scheduling conflicts, next year will be my tenth year of attending the National Book Festival. One of the side-effects of attending the Festival is that I add new books to my to-read list. Like all additions to this list, sometimes it takes me a while to get around to reading them. Enter list-making fun! I decided to make a list of books to read before the next National Book Festival, one book from each year I attended, more or less. Each book has to be by an author I saw at the Festival, and must be either the book that the author was promoting at the time, or a book that was published prior to that year of the Festival. 2012: Nalo Hopkinson – Skin Folk and/or Raina Telgemeier‘s Smile. 2011: Isabel Wilkerson – The Warmth of Other Suns and/or Sarah Vowell‘s Unfamiliar Fishes, and/or Siddhartha Mukherjee‘s The Emperor of Maladies. 2010: Olga Grushin – The Dream Life of Sukhanov or Anchee Min‘s The Last Empress or Timothy Egan‘s The Big Burn. 2009: re-read The Glass Castle by Jeannette Walls (this happened to be a year where I had already read books by the authors I went to see). Walls’ book is one of my favorite memoirs and she gave one of my favorite Festival talks. 2007: Actually, I’m going to skip doing this year. Looking over the books by the authors I saw that year, I am not interested in reading or re-reading any of them. Sorry, authors from 2007! 2005: Nevada Barr – Endangered Species (Anna Pigeon #5). I was really into this series at one point in time – this will be a great reason to return to it and see if my tastes still run the same. 2004: Ian Caldwell & Dustin Thomason – The Rule of Four. My friend who has also gone to the Festival with me every time enjoyed this book. Going through the older programs, it’s a little painful to realize some of the authors I missed simply because I didn’t know who they were at the time, namely Connie Willis. There were also big-name authors who I still haven’t read but would have been entertaining to see: George R.R. Martin, Diana Gabaldon, Terry Pratchett. Certainly being part of the book blogosphere has made me much more aware of authors. I scan over the author lists and bibliographies with a lot more familiarity now. Have you read any of the books in my list? 1973. Harper Perennial. Paperback. 324 pages. I saw this book in Eva‘s Library Loot back in March, and promptly added it to my to-read list because of that subtitle: Economics as if People Mattered. It’s a phrase I wish I heard more often. The excerpt above also shows Schumacher’s skill as a writer. Generally, I like my nonfiction to either be narrative or chock full of anecdotes and story. 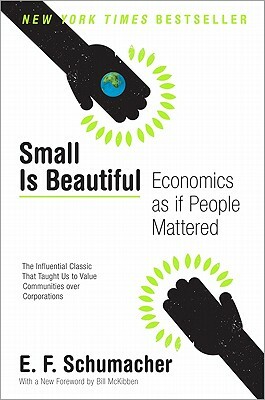 Small is Beautiful has none of that, and yet Schumacher’s passion for his subject and keen observation of economics in the modern world carried me through the book. Still, this is a forty-year old economics book. I won’t pretend that its age didn’t show at times – in his discussion of energy and technology, for instance. And Schumacher’s throwaway contention that “women, on the whole, do not need an ‘outside’ job” (p. 60) had me fuming for a while: how could a man so forward-thinking about economics and the environment be so stodgy and traditional about women in the workforce? I know the man was born in 1911, but come on, at least have the decency to explain that position, instead of mentioning it briefly in two sentences, as if it’s not worthy of deeper discussion. Certainly Schumacher’s unique background played a big part in the formation of his ideas, and I’d recommend reading a quick bio (wikipedia is fine) before reading the book. Born in Germany, Schumacher studied economics in England and eventually became an economic advisor to the Coal Board. He later was an Economic Development advisor in Burma. Though an atheist in his early life, he was interested in the tenets of other religions and converted to Catholicism two years before Small is Beautiful was published. This is how you get an author who champions coal as an energy resource, titles an essay “Buddhist Economics,” and alludes to both the Bible and Gandhi in his arguments. It’s actually a pretty fascinating mix of influences. I think the best stuff is in the first section, The Modern World, and in the third section where he discusses international development in other countries. The first section is where I found many resonant and relevant passages. I have found myself mulling this idea over – what would the world look like if the priority was to increase employment opportunities rather than maximize profits? If the business world thought in terms of how they could provide more jobs for people who needed them? There are a lot more ideas in this book, such as the way natural resources are treated as an unlimited resource and the problems of transplanting Western economic models into developing countries. However, I don’t have the motivation to make a super-lengthy post, much less an expectation that anyone would want to read a lengthier post.